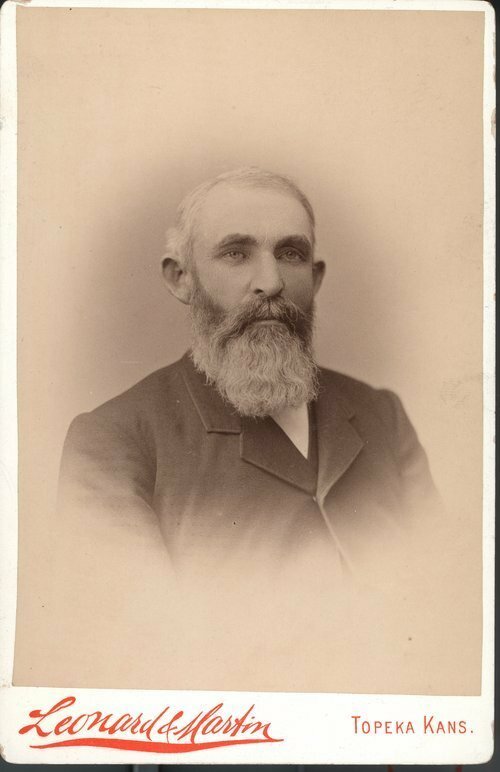 This cabinet card shows William H. Deckard, (1830-1887). Deckard a native of Saline, Missouri moved with his family, in the spring of 1855, to Doniphan County, Kansas. A farmer by trade he acquired and farmed 200 acres of land in the Marion Township and was actively involved his community. Deckard held membership in the fraternal organization of the Ancient Free and Accepted Masons, lodge number 35, and was elected to a number of political offices. Some of these positions included county commissioner, Marion Township treasurer, and a clerk for school district 35. He also served during the Civil War as a wagon master under General James Blunt's division. Deckard's civic duty to Doniphan County continued after the war when he was elected in 1885 to the Kansas House of Representatives as a Republican from the Second District. He served only one year in the House before being elected in 1886 to the Kansas Senate. Deckard's lifelong dedication to the community came to a close on January 27, 1887, when he died at the age of 56. Burial was at Rosedale Cemetery in Doniphan, Kansas.